Looking for a truly unique experience? Descend underground at Central Deborah Gold Mine, home of Australia's deepest underground mine tour, and catch 'gold fever'. The passion, enthusiasm and knowledge of the tour guides is contagious and you can't help but become enthralled by the beauty and lure of gold as you are guided through the honeycomb of underground tunnels where almost one ton of gold was unearthed. 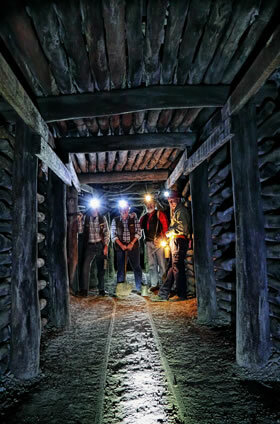 With only the light on your cap to light the way, the silence of being far below the hustle and bustle of the city and the cool underground temperature, helps you imagine what conditions as a miner were really like during the harsh gold rush era. -	Mine Experience Tour: 75 Minutes, 61 metres underground. Children 3 years and over. -	Underground Adventure Tour: 2.5 hours, 85 metres underground, lunch included. Children 8 years and over. After you venture underground, tour the surface of the mine with its treasure trove of vintage mining machinery and try your hand at gold panning for riches ... Who knows, you might even strike it rich!